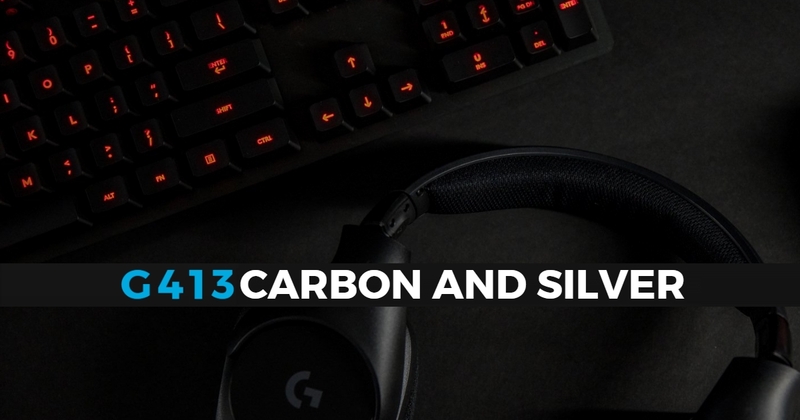 Good Gaming Keyboard – G413 Mechanical in Silver and Carbon! UPDATE: Hands on the with new Silver G413 – it’s beautiful! Hot on the heels of the excellent TKL Gaming Keyboard just released (Ten Key Less, it basically means no numpad :P), those fine folks at Logitech G have just released another TWO new metal keyboard options for us! Full sized but lightweight with high strength aluminum alloy top casing for added rigidity along with a slim, blade-like form factor thanks to the way the keys raise off the board – they’ve done something brilliant here within the keycaps and the LED lighting on these doesn’t suffer from the light leakage issues you may have experienced in the past with other slim metal board designs, the package even includes extra gaming keycaps that are interchangeable with the ones in the keyboard as well as a keycap puller to get those keys out when you feel like it. The media, brightness and volume controls are now integrated as secondary functions accessed via the F keys. and you can also setup your favourite programmable macros for games via the Logitech Gaming Software suite. Two distinct versions are available, the first is Carbon Black with a red LED backlight and the second is a super cool looking Silver G413 version with white LED. We first caught a glimpse of the Zalman Gaming Keyboard at the recent Computex 2016 Expo and it captured our attention immediately, so good were the first impressions of this keyboard that we returned for another go with it the next day. What made the the Zalman Keyboard stand out? To begin with, the ZM-K900M has the ability to customise everything directly from the keyboard and will store your choices via the keyboards internal memory. This means that you can create a macro and save when connected to any computer without having to install dedicated software. It doesn’t end with gaming macro either, you can customize everything on the K900m from the keyboard and when you connect it to another system all your perfectly tuned settings will be ready to enjoy right away – no sync, no hassle. For those of us that use macro while online gaming we can also quickly adjust the speed of the macros and utilize loop and timing as needed, this helps ensure our commands will work even if we end up in a match with a less than ideal internet connection. The keyboard itself has some of the cleanest RGB lighting we’ve seen, it’s well constructed with very little flex when trying to bend, there are non-slip rubber feet on the kickstands and a cable management channel underneath allows you to direct the braided cable (which is also really high quality) out the left or right of the keyboard to suit your setup. The switches used are called Kailh and feel just like Cherry MX blue with quick press and satisfying click. The keyboard’s built in microphone adds a further layer of effects not often seen and with the EQ feature your RGB lighting can be used to provide some excellent visuals while you type, game or listen to your favourite tunes. Having no software makes this one very different from the other gaming keyboards we’ve used recently, usually we would talk about how what game configs were pre-available for download but seeing as this keyboard is really about doing it yourself for yourself we thought we would jump into a game to see what’s involved and how it really works. When it comes time to customise things and create your perfect layout we recommend starting out by making our keyboard a uniform colour, we choose a deep blue as this would make it easy for the goto keys to stand out (to do this push Fn+DEL and then select your chosen colour from the RGB rainbow that has appeared on the keyboard). Happy with our basic layout it’s time to make some macros! We wanted to create something that uses both mouse and keyboard presses to complete so we’ve streamlined the motion of switching to C4, throwing a charge and then switching back to our primary weapon. We then created a quick detonate charge macro and finally made a switch to pistol, unload the clip, and then return to primary weapon – this is possible on the ZM-K900M because its macro can include mouse clicks! Making these was actually very easy, there are a bunch of ready to program macro keys around the middle of the keyboard so for our C4 macro we started out by pressing and holding FN+O for 3 seconds then release at which time the keyboard began recording which is signaled by a little blinking light at the top left – from here it was as simple as pushing 4 (for C4) then left mouse click (deploy a charge) and finally 1 (to switch back to primary) – we continued through in the same fashion to make our other macros – so much fun but it sort of feels like cheating! We’ve done something a little different to show off how well the live macro recording works with timings 🙂 We thought it would be fun if we jumped on a Gaming PC and went for a little drive in Dirt Rally while recording, then restarted the race and had the keyboard macro do the driving for us – surprisingly it worked! 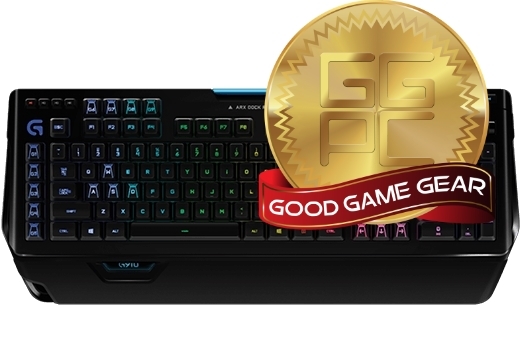 Although this one’s a bit harder to master than something with dedicated software that’s what sets this Zalman Z-Machine Gaming Keyboard apart from the rest, and with some very unique and excellent features we are happy to add this fine keyboard to our GGPC recommends list – the ZM-K900M Gaming Keyboard is GOOD! Cooler Master have got another new gaming keyboard – well actually this one’s a combo! 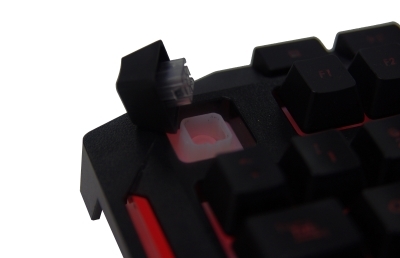 Introducing the new Cooler Master Masterkeys Lite 🙂 Unlike the above gaming keyboards which use the Cherry MX this new value keyboard is packing CM’s own mem-chanical switch which not only feels great but also conforms to the Cherry MX standard shape so we can add aftermarket custom key caps very easily, it’s still early days for the Maker Hub but we’ll be keeping an eye on this for 3D printable models to appear, until then Thingiverse certainly has more than enough to keep us modding! 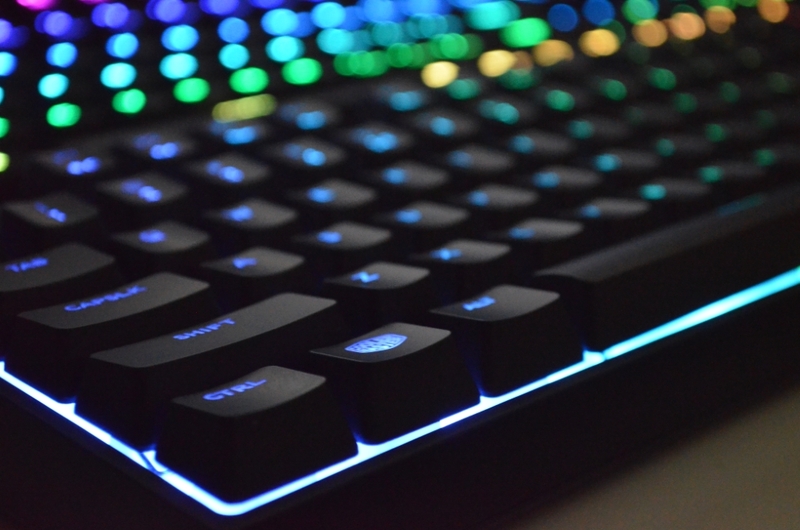 While the Masterkeys Lite Keyboard might not be quite as bright as its big brothers this keyboard still produces that clean RGB LED glow we’re in love with. They’ve added something really interesting to the kickstands by running a grippy texture along the back so when you’ve got the keyboard laying flat it still sticks to your desk like glue. Even though the target is value this keyboard is still very well built and you can change the LED lighting to suit you setup quickly and easily from the keyboard itself without additional software or drivers needed, simple must haves like disabling the windows key (which is printed with a Cooler Master logo on this keyboard) can be done easily by pushing Fn+F12 and you’ll also find a host of media and lighting controls can be accessed in the same way. The included mouse is a nice shape has an LED indicator that flashes in several colours as you change though the DPi settings lighting up the scroll wheel and also a thin strip at the base of the mouse, you can make this glow constant and even cycle to a RGB breathing mode by clicking the DPi shift + scroll wheel simultaneously – awesome stuff Cooler Master! The version we have to play with has a L on the box as well which leads us to believe a second 10keyless version might be on the way which is always nice (UPDATE: Yep, there’s a new S version), in any case this is certainly the best entry level combo we’ve had the pleasure of using in a long time (since the Cooler Master Devastator II actually) and we’re happy to give this new value gaming combo our GGPC recommends badge – the Masterkeys Lite is GOOD! The Steelseries Apex M500 delivers the gaming features from the popular Apex series giving you the keys to victory (lol nice pun SteelSeries). 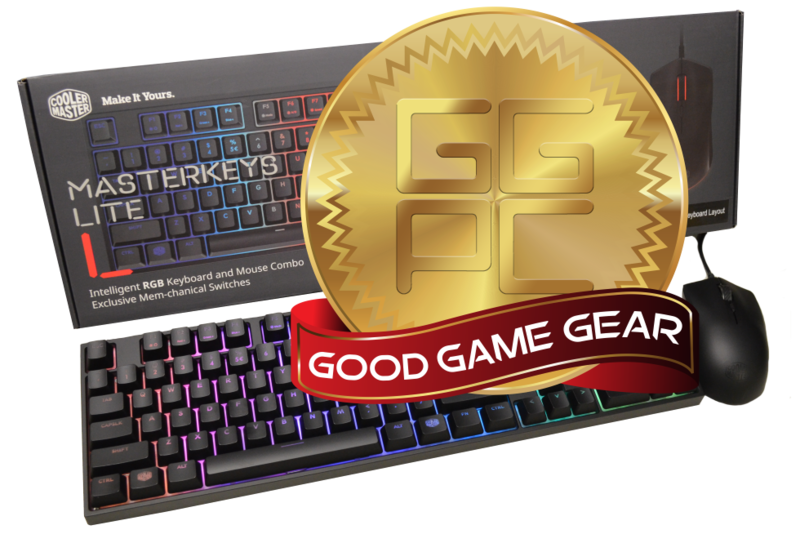 A tournament-grade backlit mechanical gaming keyboard built to meet the requirements of top level gamers, SteelSeries really have created an excellent keyboard for gamers that game – with features we’ll actually use and an emphasis on quality that is well received. Created with the toughest plastics and reinforced with a battle-hardened steel back plate, they’ve gone to extra lengths to ensure the construction and materials can withstand anything thrown its way. A standard key layout means no learning curve and no surprises and with Cherry key stems, gamers can swap out the keycaps for a custom set and everything fits perfectly. With the SteelSeries Engine software you can easily customize your keyboard with macros, setting these up has never been easier and text based, key-press, and-on-the-fly macros can all be programmed and set with ease. Your profiles aren’t limited to just your keyboard either, you can program any key to cycle between your keyboard, headset, and mouse profiles. You can even auto-deploy your exact settings right when you launch your games, crazy cool. Combine all this with the smaller details like cable management channels underneath, rubber non-slip kickstands and a beautiful evenly lit glow from the blue LED (also the base plate is blue which is nice) and you’ve got a well thought out, quality keyboard. Now that we’ve had a game or 12 with this excellent new peice of gaming tech we are happy to give it a well deserved recommendation to anyone looking for a new mechanical gaming keyboard at a great price – The SteelSeries Apex M500 is GOOD! The SteelSeries Apex M500 is available overseas but we haven’t seen stock land in New Zealand yet so keep your eyes on our NZ computers blog and we’ll update as soon as this epic nww keyboard arrives! 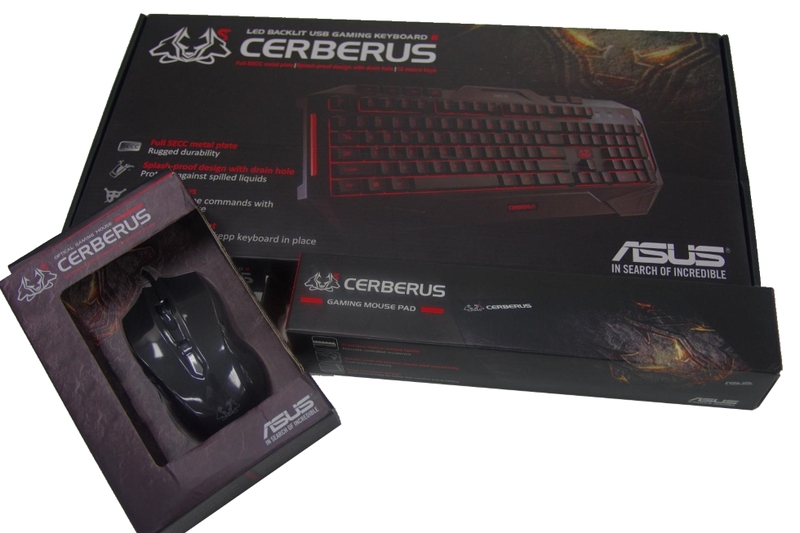 Asus have just released a new gaming gear combo named the Cerberus and it’s a pretty impressive setup for those looking to kit themselves out on a budget. The bundle consists of a gaming keyboard, mouse and mousepad which all come in separate boxes so I expect we’ll be seeing all the items available separately soon. Taking a closer look at the combo the comparison must be made with the Cooler Master Devastator gaming bundle as the keyboards are very similar in design, this is not a bad thing at all for Asus with CM version being an extremely well reviewed budget gaming combo! There are a few differences though and the Asus version can display the keys backlight in red or blue depending on your preference – it’s important to note that the red bars on the side will still glow red though even if the keys themselves are set to blue. The Cerberus mouse at first glance appears ambidextrous but with the thumb buttons being placed on the left side it’s certainly a preferred right hander. 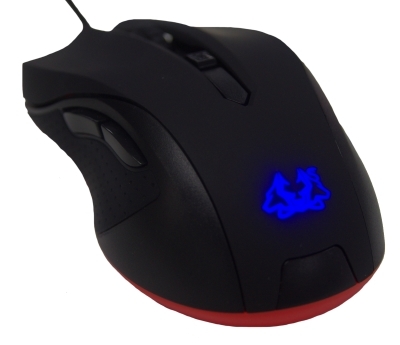 It’s a four button design well suited for 1080p gaming, the sides have non-slip rubberized grips and the cable is a solid 1.8 meters. The cable is braided (same with the keyboard) although the USB connection for the mouse is anti corrosive gold which is nice 🙂 Unlike the keyboard the LED on the Cerberus Mouse changes depending on your DPI settings – Red is 500, Green is 1000, Blue is 1500 and the LED turns pink at 2500 (max). Finishing the combo off is a pretty sweet Cerberus mouse pad featuring the three headed dog logo in all its glory, the texture gives good control for your mouse and the stitching on the sides is excellent. Overall, it looks like Asus might just have created the perfect starting set for a new gaming pc gamer and we’ll get some more pictures up on the GGPC Instagram so you can take a closer look at this awesome new kit!